The Advisory Board Company will sell its healthcare business to UnitedHealth Group’s Optum. The education part of its business will be acquired by Vista Equity Partners. The breakup and acquisitions were accurately rumored in early July. The healthcare business drew $1.3 billion of the $2.58 billion total deal value. Advisory Board said in February that it would explore strategic options after an ownership stake was taken by activist investor Elliott Management, which is now exerting similar pressure on Athenahealth. From Athenahealth Spokesperson: “Re: Givenchy’s comment from the 8/23/17 HIStalk regarding financial success metrics for community hospitals. Thank you for bringing this to our attention. The metrics listed were a carryover from the previous iteration of the page and speak to our results on the ambulatory side. We have removed the numbers to avoid any confusion.” I speculated in my original response that the metrics probably weren’t related to hospitals, especially since they were footnoted to suggest all Athenahealth customers excluding hospitals since the company wasn’t in the inpatient business during that pre-RazorInsights benchmark period. From Whassup: “Re: MDeverywhere breach. The newly listed breach affects E-MDs since it merged with MDeverywhere. Looks like they are trying to keep it hush hush, along with the fact that E-MDs is up for sale.” HHS is investigating an unauthorized access / disclosure incident of MDeverywhere that was reported August 10, 2017. Marlin Equity Partners acquired E-MDs in March 2015 and merged it with its existing portfolio company MDeverywhere, which offers revenue cycle management and credentialing services. 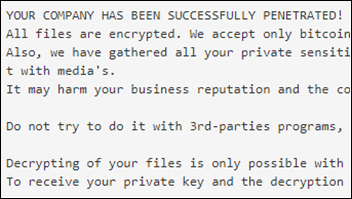 I found a breach notice sent by an MDeverywhere customer that says that the company and its customers use a messaging board to exchange patient information and worksheets, but the customer found on June 6, 2017 that any Internet user could log into the message board without entering a name and password. The non-clinical information of just 1,396 people was involved, so it’s pretty unexciting as healthcare breaches go. We continue to agree with stakeholders that the E/M documentation guidelines should be substantially revised. We believe that a comprehensive reform of E/M documentation guidelines would require a multi-year, collaborative effort among stakeholders. 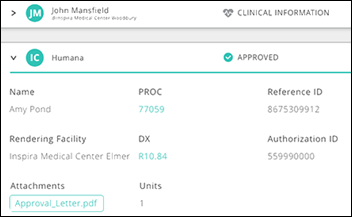 We believe that revised guidelines could both reduce clinical burden and improve documentation in a way that would be more effective in clinical workflows and care coordination. We also think updated E/M guidelines coupled with technological advancements in voice recognition, natural language processing and user-centered design of EHRs could improve documentation for patient care while also meeting requirements for billing and population health management. We recognize that achieving the goal of reduced clinician burden and improved, meaningful documentation for patient care will require both updated E/M guidelines, as well as changes in technology, clinician documentation practices and workflow …We are specifically seeking comment on how we might focus on initial changes to the guidelines for the history and physical exam because we believe documentation for these elements may be more significantly outdated, and that differences in MDM are likely the most important factors in distinctions between visits of different levels. We are also specifically seeking comment on whether it would be appropriate to remove our documentation requirements for the history and physical exam for all E/M visits at all levels. We believe medical decision-making and time are the more significant factors in distinguishing visit levels, and that the need for extended histories and exams is being replaced by population-based screening and intervention, at least for some specialties. In addition, an increase in the utilization of EHRs, and to some extent, shared health information via EHRs, may have changed the character of extended patient histories since the guidelines were established. As long as a history and physical exam are documented and generally consistent with complexity of MDM, there may no longer be a need for us to maintain such detailed specifications for what must be performed and documented for the history and physical exam (for example, which and how many body systems are involved). We are seeking comment on whether clinicians and other stakeholders believe removing the documentation requirements for the history and physical exam would be a good approach. Texans need our help, so I invite you to do as I did in making generous donations to The Salvation Army of Houston, the Houston Food Bank, and the Houston SPCA. The best thing you can do is to send money to reputable local organizations – it’s just too hard to deploy well-intentioned contributions of physical items and those organizations need the flexibility to use their buying power to provide the most benefit. Houston has a marketing problem – it’s the nation’s fourth-largest city, yet few of us visit there on vacation or attend a conference there, so we don’t really have much of a connection to it. As was the case with Hurricane Katrina, the extent of the death and destruction there won’t become evident until days after the floodwaters recede and public health issues – such as food and housing shortages – take over the shrinking headlines and outlast by years the nation’s short attention span. Meanwhile, in a discussion that mimics our country’s healthcare debate, a Politico report blames the federal government’s subsidized flood insurance program for encouraging people and developers to build and re-build homes in known floodplains and to pave over drainage areas. More than half of the country’s “repetitive loss properties” are located in Houston, second only to New Orleans, as the federal flood insurance program is running $25 billion in the red. One federally insured home in Mississippi has flooded 34 times in 32 years, with federal taxpayers paying $663,000 for claims involving the $69,000 home, while members of Congress have voted to delay charging homeowners actuarially sound premiums following complaints about inevitably higher prices from coastal communities. Only 15 percent of Houston homes are insured against flooding since such insurance isn’t required for most mortgages and people either can’t afford the premiums or play the odds that they won’t experience a loss. 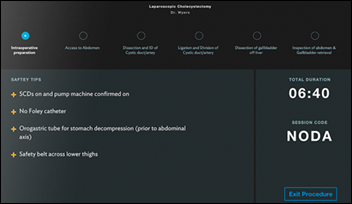 Surgery management system vendor ExplORer Surgical raises $3 million. India-based technology vendor Tech Mahindra names Jacksonville, FL as its global healthcare headquarters following its $110 million acquisition earlier this year of Jacksonville-based The HCI Group. A Stanford drop-out distances his startup from Theranos in describing its own in-home finger-prick blood analyzer. The co-founders of Athelas are 20 and 22 years old. 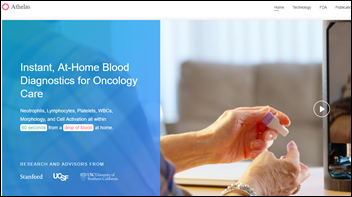 Their Amazon Echo-like technology, which has yet to earn FDA approval, uses machine learning to analyze blood cell images that pathologists have interpreted and then applies that knowledge to new high-resolution images of a patient’s home blood sample. Their target market is oncology patients who require frequent blood tests. Columbus, OH-based PriorAuthNow increases its funding to $3.6 million to expand its hospital procedure prior authorization system. 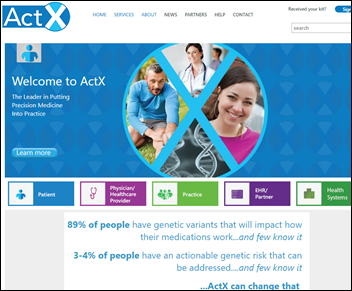 Yale New Haven Health System (CT) will add pharmacogenomic decision support from ActX to its Epic EHR. Marc Milstein (University of Texas System) joins University of Texas Southwestern Medical Center (TX) as VP of information resources. 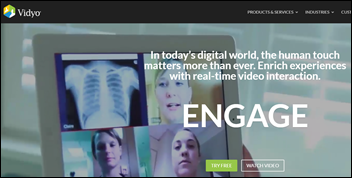 Allscripts will integrate Vidyo’s video visit technology into its FollowMyHealth patient portal. Cedars-Sinai launches a 20-month, $25,000 executive master’s degree program in health delivery science that emphasizes analytics, health IT implementation, quality and safety, and cost-effective service delivery. 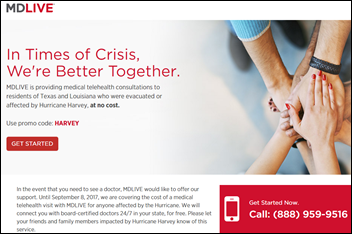 MDLive offers free non-emergency telephone or video visits to people impacted by Hurricane Harvey from August 25 to September 8. 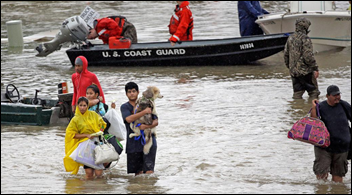 T-System offers its T Sheets disaster relief documentation templates at no charge to hospitals and freestanding EDs in areas affected by Hurricane Harvey. 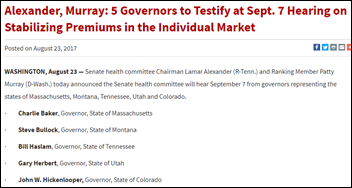 The Senate’s HELP committee will hold hearings early next month in hopes of creating legislation to stabilize and then improve the Affordable Care Act individual insurance marketplace. Leaders Senator Lamar Alexander (R-TN) and Senator Patty Murray (D-WA) have successfully collaborated previously on the 21st Century Cures Act. The committee will take the unfortunately refreshing approach of holding actual committee hearings and seeking input from lawmakers on both sides of the political wall. Alexander wants to quickly get legislation on the books to guarantee the federal government’s payment of legally challenged insurance premium subsidies, hoping to reduce the number of insurers pulling out of the individual market or raising premiums due to uncertainty. System downtime at Scotland’s NHS Lanarkshire is being blamed on a new variant of Bit Paymer ransomware, which demands payment of an unusually high ransom of $218,000 for the return of “private sensitive data.” Mass media articles say the malware is spread by phishing emails, but technical sites say it is manually installed following brute force password attacks on insecure Remote Desktop Protocol connections, after which the size of the ransom is set by the hacker’s perception of the victim’s ability to pay. A former ED employee sues Northwell Health for firing her for looking up Justin Bieber’s medical records, claiming she didn’t do it and instead was fired just because she’s female. Somehow I suspect Northwell’s audit logs contain information that implicates her beyond her gender. A Salesforce research paper covers the potential of translating natural language questions into database SQL queries, which could allow users to ask database questions without knowing SQL syntax. 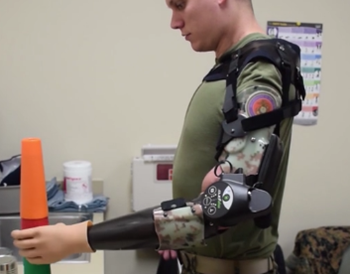 A Department of Defense video shows how Walter Reed National Medical Center (MD) makes prostheses. Bloomberg Businessweek covers predatory journal publisher Omics International, an India-based open access journal publisher that charges “publish or perish” academics to run their often poorly prepared research papers as well as those of drug companies that want to disseminate favorable but sloppily researched studies. The founder of Omics calls the FTC’s investigation into his company – which took in $11.6 million in publishing and conference revenue in 2016 – as “fake news.” The article questions whether the company’s journals that feature papers that are “rife with grammar glitches and low-resolution headshots” are confusing drug companies that publish research in them or whether they really don’t care. Omics has 2,000 employees who occupy 250,000 square feet of office space in Hyderabad. Academic and business speakers pay more than attendees to participate in its conferences, which says a lot, while all attendees get 50 percent of the publishing fee for their next research masterpiece. I bet quite a few healthcare organizations are unwittingly underwriting this ego-boosting crap in sending people off to fun destinations under the guise of academic achievement. The company repeatedly accepts hilariously fake article and conference presentation abstracts, one that was submitted as a test being “Evolution of flight characteristics in avian-porcine physiology” that purports to explain how pigs fly. Another author submitted a journal article consisting of 10 pages of the repeated phrase, “Take me off your $&%#! list,” which was happily accepted pending payment of a $150 publishing fee by The International Journal of Advanced Computer Technology. AssessURHealth and Intelligent Medical Objects will exhibit at Greenway Engage17 September 7-10 in Orlando. 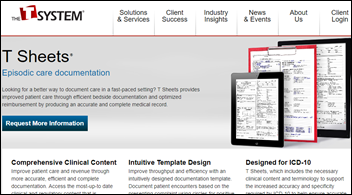 FormFast publishes a new case study featuring Duncan Regional Hospital (OK). Healthwise will exhibit at the 2017 HCEA Conference September 6-8 in Salt Lake City.